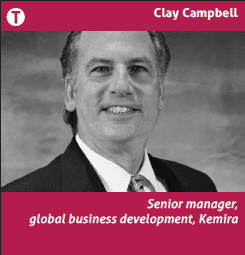 Kemira talks us through the latest chemical technical developments relevant to your business. Historically, it has been quite clear in the manufacture of hygienic paper grades (bath, towel, facial and napkin), which ones have wet tensile specifications and the type and level of wet strength chemistry utilised. Polyamidoamine epichlorohydrin (PAE) resin has been exclusively used to provide permanent wet strength (PWS) sheet properties. Recent advanced development of modified glyoxyalated polyacrylamide (GPAM) temporary wet strength technology (TWS) make this chemistry not only a viable option now but possibly the preferred one if one considers its total value proposition. GPAM temporary wet strength technology offers manufacturers’ process efficiency benefits as well as sheet strength enhancement options that previously were not available. This presentation discusses each key tissue grade strength requirement in their respective market segments; “At Home” (AH) consumer and “Away From Home” (AfH) commercial. Conventional manufacturing processes, and the thoughts behind them, will be challenged in this presentation. Two case studies will be presented. The first, commercial consumer (AH) bath tissue, will be presented to illustrate how utilising new glyoxyalated polyacrylamide temporary wet strength technology addresses the market need to be strong while wet, without flushability issues compared to PAE permanent wet strength. The second case study will clearly demonstrate how substituting GPAM-TWS for PAE-PWS in a recycle white towel provides significant benefits to the manufacturer. In some applications, packaging and board for example, the permanent wet strength attributes of PAE resin is essential in maintaining the performance of the packaging material stored in a wet environment for a long period of time. This is necessary because of the refrigerated storage required to maintain food quality up until it reaches the consumers. The use of paper is much faster when considering applications for the various tissue and towel grades. The act of wiping the hands or the face, for example, does not last more than a few seconds. The consumer uses the paper (bath, napkins, toilet, and AFH towel) and then immediately discards it. The wet strength, in these cases, does not have to last more than a few seconds. However, historically, in both cases the same wet strength chemistry applied is the same – Polyamidoamine Epichlorohydrin (PAE) permanent wet strength resin. Newly developed Glyoxyalated Polyacrylamide (GPAM) technology for the tissue market provides initial tensile fully sufficient for its functional purposes, but has the added benefit of high rate of decay leading to better flushability and disposal. The product performance feature also can translate to easier reuse of any GPAM treated broke in the manufacturing process compared to that produced with PAE-PWS. As they are distinctly different chemistries, new GPAM-TWS technology can increase crepe control performance, reduce felt filling, and improve broke repulpability compared to PAE application. Additionally, GPAM provides dry strength and improves sheet drainage/sheet drying in the papermaking process. It is widely known and expected that PAE-PWS wet strength decay rate will only be 10-15% after a paper sample is subjected to 30 minute soak test. 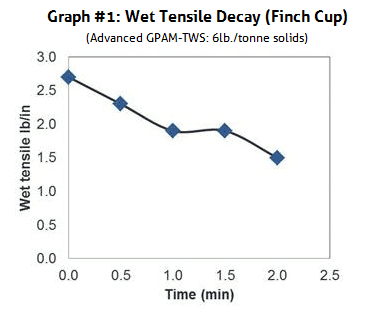 As shown in Graph #1, advanced GPAM-TWS technologies can provide much faster and controlled rate of decays in the range of 40-60% decay rate within 2 minutes paper soak time. 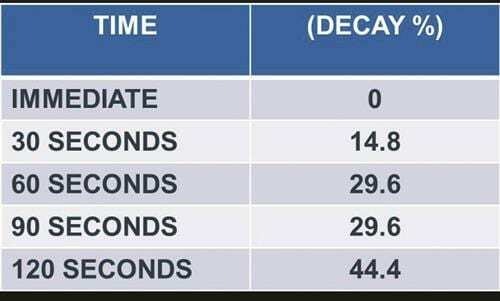 Significantly higher percent decay and higher rate of decay! New advanced GPAM-TWS technologies are vastly improved over conventional GPAM technology allowing for both a wider range of cationic charge properties and significantly longer shelf life. The determination of whether a PAE-PWS and/or a GPAM- TWS/DSR technology should be utilised is dependant on the specific grade type, commercial market and the wet and dry tensile specifications. Even though PAE- PWS has historically been an industry standard, there are now other viable options available. Table #1 illustrates suggested wet strength guidelines for utilising PAE – PWS and GPAM – TWS technologies. Consumer Towel: Continues to require PAE-PWS as customer typically reuses and rewets towel and sheet decay may not be desired. * Test results from a February 2009 laboratory study completed by K. Redway, Department of Biomedical Sciences at the University of Westminster London showed that paper towels efficiently dry the hands of users achieving 90% dryness in approximately 10 seconds. Store-bought samples of Consumer (AH) premium bath tissue samples were evaluated from both the U.S. and Brazil. The majority of bath tissue in Brazil is made with Permanent Wet Strength (PWS) to control dust and lint on machine and improve converting processes. However this may be the root cause for why the population does not flush bath tissue, and, instead are asked to place it in trash cans as the work around solution to the very low wet strength decay and decay rate of the PAE- PWS. Figure #2 visually shows the decay of various tissue brands at an initial immediate soak along with a 5 and 10 minute soak. 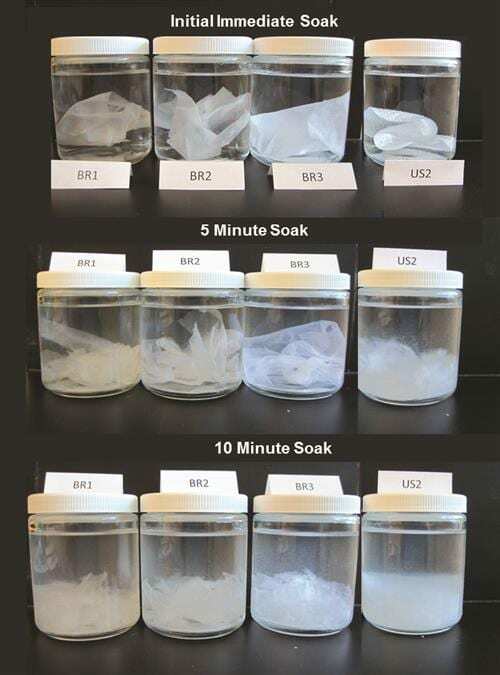 Br1, Br2, and Br3 tissue samples, which are South American premium consumer (AH) bath tissue grades, start breaking up between five to 10 minutes, but there are still large pieces at 10 minutes and even a few large pieces left after 30 minutes soak time. For the US2 a sample, which is a consumer premium bath tissue grade using GPAM-TWS, the US2 sheet is significantly dispersed within five minutes soak time. This study clearly shows that the commonly used consumer premium bath (toilet) tissue brands in South America have poor rates of wet strength decay and can certainly explain in part the end user concern with both poor flushability and disposal. The root cause of the poor decay rate is most likely the utilisation of PAE-PWS. Implementation of effective GPAM-TWS application, as demonstrated in the US2 sample and one of the leading consumer bath tissue grades in the US, effectively demonstrates strong while wet with good flushability. A wet crepe machine producing single ply, 21 # basis wt. recycle white towel utilized 14.3 lb. /tonne, dry solids basis, of PAE-PWS. GPAM-TWS was added at 3 lb. /t, dry solids basis, allowing the PAE-PWS to be reduced by 30% to 10 lb. /tonne. There were multiple economic benefits achieved with this new wet strength programme. These included the ability to reduce basis wt. from 21# to 18# generating $50/t in fibre savings due to the GPAM dry strength enhancement and 7% reduction in energy from the gas hoods thru improved sheet drainage and easier sheet drying. As well, converting efficiency was improved by 40%, requiring less operator sheet rethreading and increased throughput. White water turbidities were reduced by 50% and polymer usage in the DAF clarification process was reduced by 30%. Whether utilising PAE-PWS and/or GPAM-TWS, it is important to understand and, if possible, control the process water chemistry to maximise wet strength performance efficiency (WSPE). The ideal process conditions for GPAM-TWS applications is an operating pH of 4.5-7.5 and less than; 400ppm hardness (ppm CaCO3), 5ppm sulfite, 150ppm alkalinity and 2,500ppm conductivity (ựS/cm). In tissue manufacturing processes utilizing virgin fibre sources, low pH (5.5. -6.0) eucalyptus and acacia virgin fibres are commonly used. However, in many cases operators intentionally increase the alkalinity and pH by adding caustic soda or soda ash in the wire pit or pulper for several reasons or beliefs; improved crepe control operations, improved WSPE and greater sheet bulk from fibre swelling. New effective technologies in crepe control (FennoCrepe patented crepe adhesive) and TWS / DSR (FennoRez GPAMs ) allow processes to run very effectively at lower pH levels while obtaining sheet quality benefits and achieving operating process efficiency levels never seen before. The graph clearly illustrates the wet strength performance and rate of decay differences between GPAM-TWS and PAE-PWS at various pH ranges. PAE-PWS consistently demonstrate low rate of decay (<15% in a 30 minute soak) across the pH spectrum. However, GPAM-TWS provides excellent overall wet strength decay and increasing wet tensile strength performance as the pH is lowered. Even though the GPAM-TWS provides wet and dry strength in the 7.0-8.0 pH range, the overall performance is improved significantly as the pH is reduced below 7.0 with low alkalinity. The use of permanent wet strength-PAE to obtain sheet wet tensile properties has been used for decades in manufacturing the majority of tissue and towel grades due to lack of viable alternative wet strength technology. FennoRez temporary wet strength technology can significantly reduce and potentially eliminate PWS- PAE chemistry, offering the manufacturer an alternative option in management of the wet end process, wet and dry tensile strength sheet properties, and the rate of wet tensile strength decay. The case study #1, application of PWS in bath tissue, clearly highlights and illustrates the need for manufacturers to reevaluate the selection of wet strength technology on a grade specific basis to ensure proper alignment for process operating efficiency, meeting key sheet specifications, addressing end user needs and improved environmental sustainability. The practice of PAE-PWS application in bath tissue grades may not be limited to just Brazil and South America. Substitution or elimination of PWS in commercial (AFH) towels with GPAM-TWS offers manufacturers a variety of economic benefits ranging from fibre substitution, reduced repulping time, reduced felt filling and the ability to introduce new and improved environmentally friendly tissue and towel products (even a flushable towel). A process audit can be completed that incorporates the potential overall economic and quality benefits of lower pH (5.5-7.0) tissue making. This audit should take into account program and process goals. This can be an important step to unlock the full potential GPAM-TWS can bring to an operation for specific tissue and towel grades. Clayton Campbell is senior manager, global business development; Harold Goldsberry is strength and sizing marketing manager for the Americas; Kristin Wittich is an R&D scientist and Felipe Higa is a tissue application specialist for Southern America. Share the post "Grade specific optimisation: Permanent (PAE) versus temporary (GPAM) wet strength utilisation"